Roast goose and turkey are the stars of these recipes for fall and winter holiday celebrations. 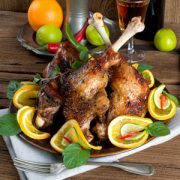 Roast goose traditionally makes its first holiday appearance of the season as the main dish on St. Martin’s Day, and then may appear on Christmas and New Year’s tables as well. Roast turkey is a more recent choice. Both special occasion and everyday recipes are included below. This festive entrée combines all the classic food and flavors of a traditional German holiday feast: succulent goose, nourishing dumplings, red cabbage infused with red wine and spices, with the wonderful seasonal touch of chestnuts. The first goose of the season is eaten on November 11 (St. Martin’s Day) and it’s the traditional German Christmas dish. Roast goose frequently appears on menus all over Germany. Its dark, delicious and tender meat cooks to a light crispiness on the outside while the rich skin means the flesh bastes itself. Cook tasty liver pate and rye breadcrumbs stuffing balls alongside and, for a special serving, add halved fresh peaches baked and glazed with sugar and red currants. A great version of the classic holiday menu features pan-seared goose and sauerkraut which is infused with wine, brandy-soaked plums and bold flavors (garlic, ginger, juniper berries). The creation is rounded off with crispy potato pancakes. Try a fresh take on the standard burger, using ground turkey with sauerkraut and cheese. A great side dish would be a German potato salad, or a pasta salad made with German spätzle. “Geschnetzeltes” refers to a specific way of cutting meat into thin strips. This method of preparation enjoys great popularity in Germany. Rösti, a pancake-like potato hash patty, is originally from Switzerland but is often incorporated into German cooking. Juicy skewers with grilled turkey breast, squash and onions, drizzled with a flavorful blackberry sauce and served with grilled slices of baguette.